East Berlin was the name of the eastern part of Berlin between 1949 and 1990. 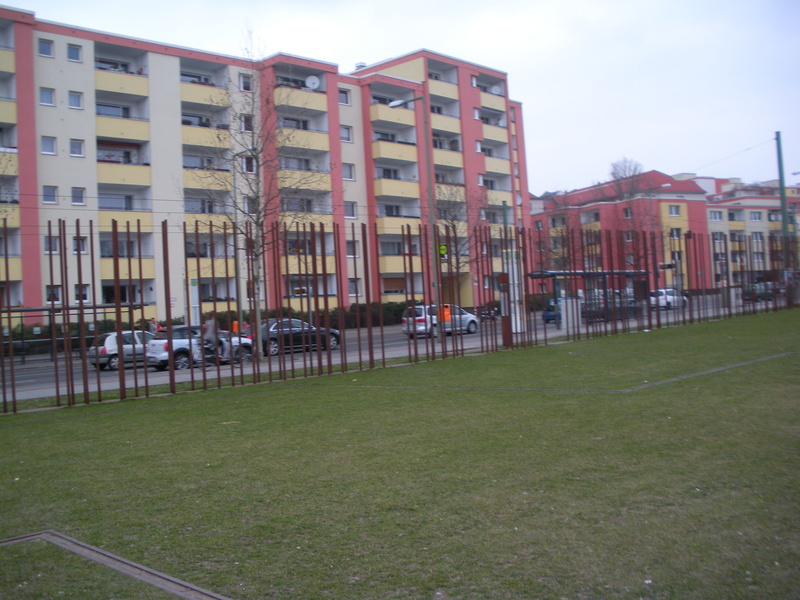 It was the Soviet sector of Berlin that was established in 1945. The American, British and French sectors became West Berlin, part of West Germany. Although it was always legally a part of an occupied city, East Berlin was claimed as the capital of East Germany. 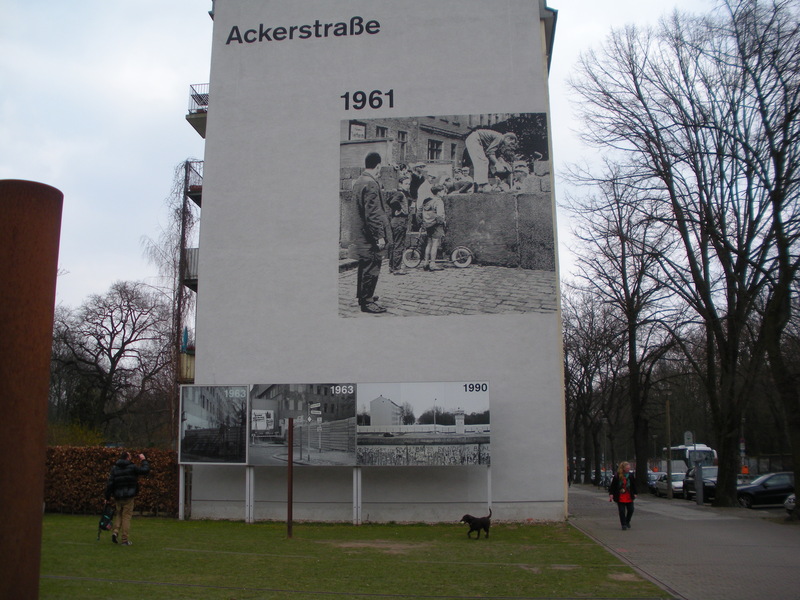 From 13 August 1961 until 9 November 1989 it was separated from West Berlin by the Berlin Wall. The East German government referred to East Berlin simply as “Berlin” or often “”Berlin, Hauptstadt der DDR” (Berlin, capital of the GDR). The term “Democratic Sector” was also used until the 1960s. On October 3,1990, West and East Germany were united and East Berlin ceased to exist. Since reunification, the German government has spent lots of money on rejoining the two halves of the city and bringing services and buildings in the former East Berlin up to the standard in West Berlin. 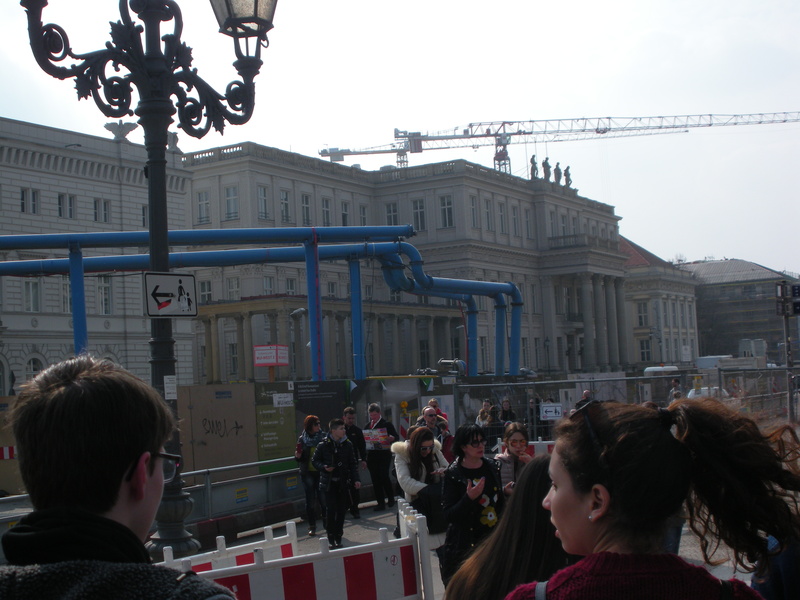 There are still differences between eastern and western Berlin. There are a lot more pre-war buildings in Eastern Berlin, some still show signs of wartime damage. The style of architecture used in the whole of the GDR was very different from that used in rebuilding West Berlin. 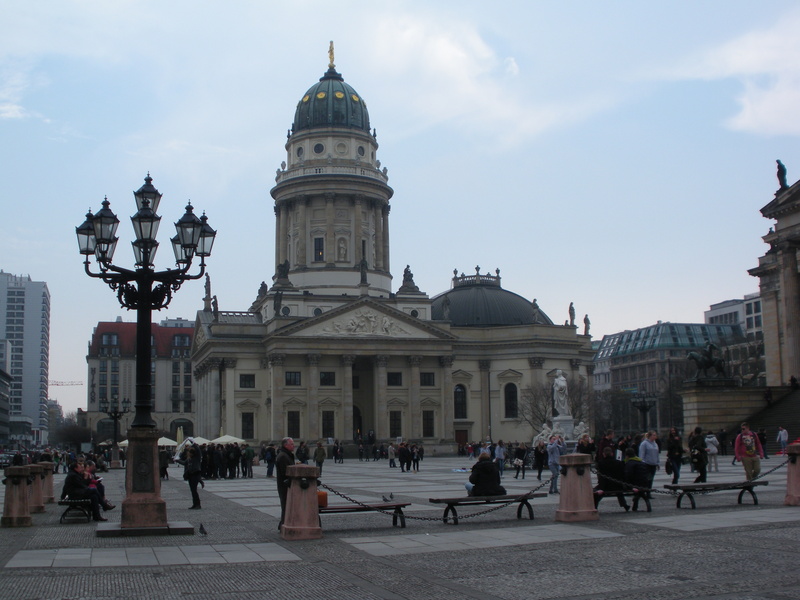 The twin buildings on the Gendarmenmarkt are the French Dom (we climbed up the tower!) 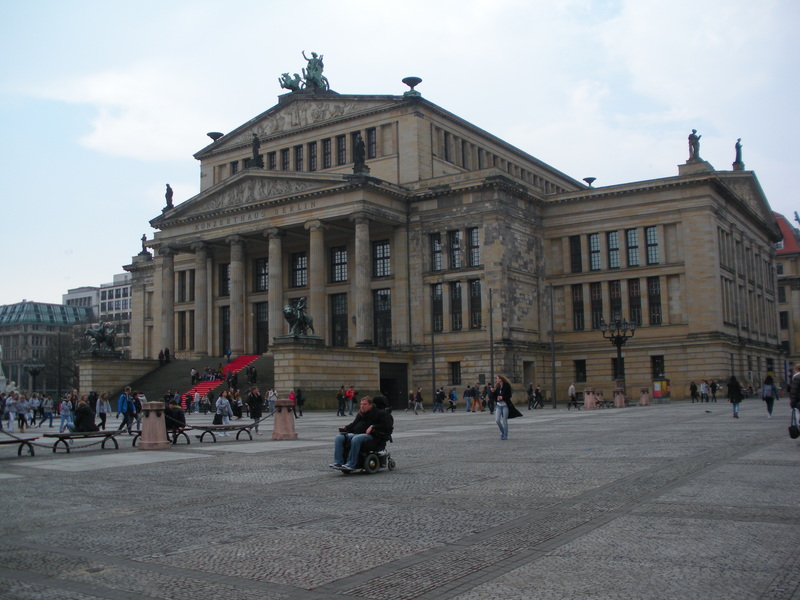 and the Deutsche Dom, with the Schauspielhaus (concert hall) in between. In 1964 Walter Ulbricht, leader of the Socialist Unity Party which governed East Germany, decided to allow the construction of a television tower on Alexanderplatz, modelled on the Fernsehturm Stuttgart and the first artificial Earth satellite, Sputnik. Construction began on August 4, 1965. 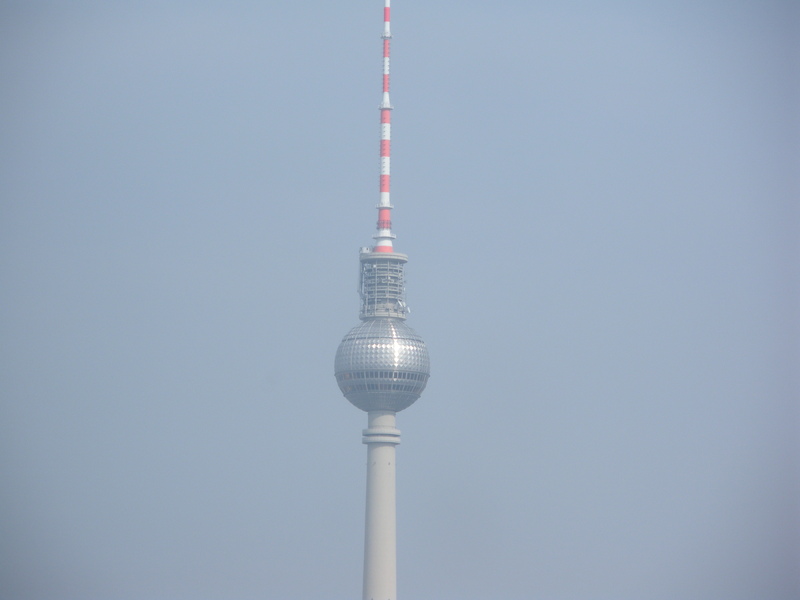 After four years of construction, the Fernsehturm began to test broadcasts on October 3, 1969, and it was officially inaugurated four days later on the GDR’s National Day. When the sun shines on the Fernsehturm’s tiled stainless steel dome, the reflection usually appears in the form of a cross. This effect was not anticipated by the architect. 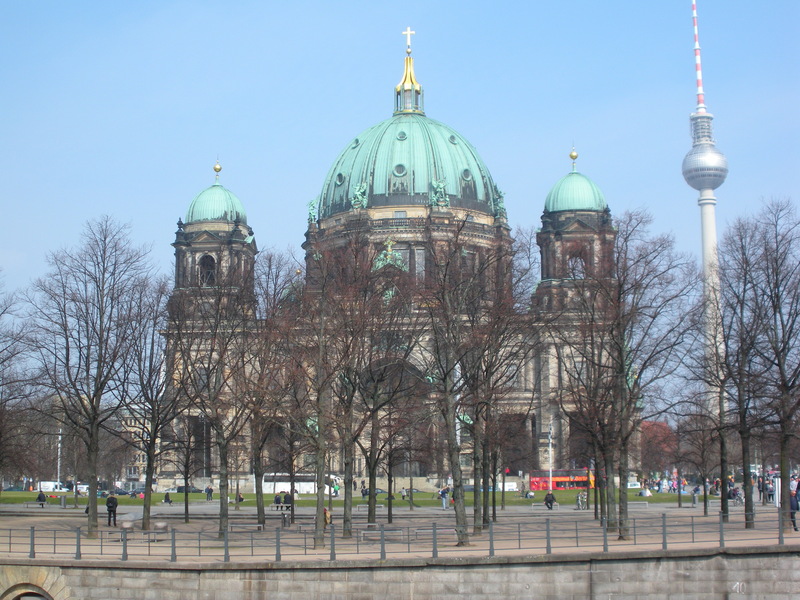 Berliners nicknamed the luminous cross Rache des Papstes, or the “Pope’s Revenge”. U.S. President Reagan mentioned this in his “Tear down this wall” speech on June 12, 1987. We went to the Berlin Wall Memorial and Marienfelde Refuge Center Museum-they have a wonderful computerized version of the wall being built and how it was monitored to search for people trying to get over to West Berlin. Bernauerstrasse was a street(located in the middle of the capital) that was literally cut in half when the Wall went up-there was a period of about 24 hours where people were quickly jumping out of the windows of apartments before they were all boarded up and they show film clips of this as well. I highly recommend it. They have also constructed a visual representational line of where the Wall previously was.